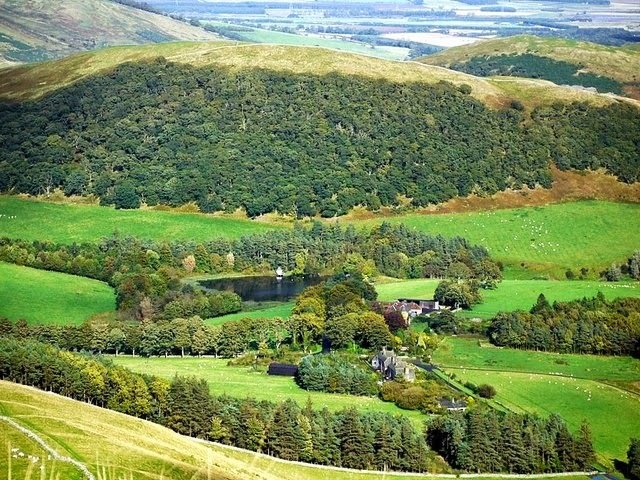 There is a story – a legend, almost – concerning the little village of Ilderton in the shadow of the Cheviots and an illegitimate line of descent from Charles II. It is a nice illustration of how a family can fall so quickly and completely from grace, leaving, of course, a trail of rumours and half-truths in their disappearing wake. One of King Charles II’s many illegitimate offspring was thought to have been a chap by the name of Charles Dartiquenave (born about 1664), though he was not officially ‘recognised’ as such. Much of the evidence for his suspected regal roots stems from the man’s blessed career path, which, it has been assumed, was guided by the royal hand. Charles loved the high life, and enjoyed his various positions to their full extent. A carefully chosen wife ensured further riches, and he died in comfort at Albury, Hertfordshire, in 1737. His son, also called Charles, enjoyed a respectable army career, inheriting his father’s many and varied possessions, too, it seems. Charles Junior died in 1748, leaving several young children, among them Charles Peter, Anne and Dorothy. The first named succeeded to the family residence, Patmer Hall (in Albury), but eventually sold the estate in 1775 for reasons unknown. For equally obscure reasons, he (together with his two sisters) then migrated several hundred miles north to take up the tenancy of Ilderton Hall, Northumberland, in 1776. Little is known of his life there, but he was a churchwarden for most of the 1780s. By 1792, though, Charles had managed to squander his resources, and his entire farming stock and equipment, together with all of his household items and possessions, were sold at auction. His creditors were invited to grab what they could in the ensuing melee, and Charles scarpered to Alnwick (some sources suggest a legal dispute over his tenancy agreement of Ilderton Hall contributed to the move). He lived in a plain house, but maintained a coach and the title of a ‘gentleman’ until his death in 1801, aged 58. However, the man – a great grandson of King Charles II – doesn’t seem to have left a will, which is perhaps indicative of the financial depths to which he had dragged the family line. Note: It is worth noting, too, that Charles’ sister, Dorothy, to whom he was very close, died in suspicious circumstances at Ilderton Hall prior to them vacating the property. Her supposed violent death resulted in a hasty burial in the garden, it was said. Stains which remain on one of the staircases of the hall are reputed to have been caused by blood from the wounds inflicted on Dorothy by her attacker. 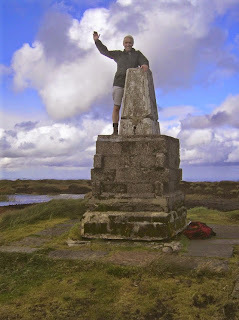 The summit of the region’s highest mountain, The Cheviot, is an uninspiring affair. Its whaleback form covers a huge area – big enough, it was once said, to hold an army. Covered by a sticky peak bog, it has recently been made more accessible by the laying of large flags which guide one to the hefty trig point. Still, though, it’s worth a climb – if only to say you’ve done it. 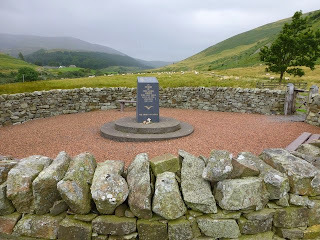 In the College Valley a little to the north of Cheviot summit lies a beautifully maintained WWII memorial. It is surely the most remote item of its kind in the UK, being kept company only by the sober and modest 1960s creation that is Cuddystone Hall. It was unveiled as recently as 1995 (the 50th anniversary of VE Day), being a tribute to the Allied airmen who lost their lives in the hills thereabouts during 1939-45. The Latin line is the RAF’s motto and means ‘Through adversity to the stars’. 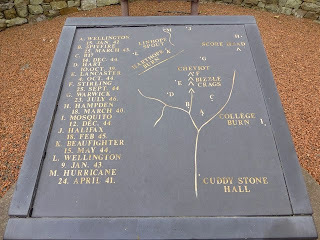 It was erected in a long overdue acknowledgement of not only the loss of the men involved in the thirteen individual incidents, but also of the brave efforts of those who ventured out into the hills on rescue missions in search of survivors. A map is inscribed on the top of the monolith showing the sites of the crashes, in which 30-odd men perished. The 1995 ceremony was conducted in the presence of the Duke of Gloucester, as well as other dignitaries and those with connections to the airmen killed. It was restored in 2005. Note: A German aircraft also met its fate in the Cheviots during WWII. 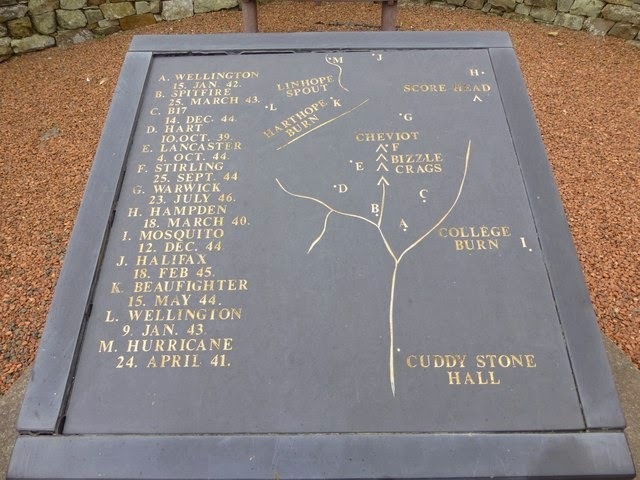 When our esteemed local hero, Cuthbert Collingwood, was elevated to the status of ‘Lord’ in the aftermath of the Battle of Trafalgar, he became ‘Baron Collingwood, of Caldburne and Hethpool, in the County of Northumberland’. And, being in possession of a fair old chunk of the lower College Valley, he determined to take advantage of the fact and do his bit for the future of the Royal Navy. Collingwood, you see, was mad keen on planting acorns – with a view to ensuring the future supply of English Oak for the replenishing of the Fleet. When he was home on leave he would often be seen wandering the hills with his dog, Bounce, and a pocket full of acorns. He would plant and scatter them here and there as he went – and would encourage his friends and acquaintances to do likewise. 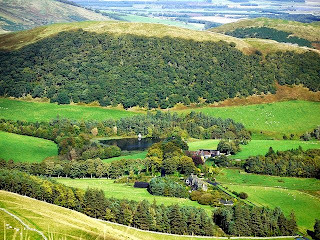 It seems he had great plans for his patch of real estate in the Cheviots; but when he died a few short years later in 1810, well, his grand design seemed destined never to leave the drawing board. However, his widow, Sarah, stepped into the breach and made quite sure that her husband’s final wish came true. For, in 1815, she oversaw the planting of 200 oak trees on the flank of The Bell, on the western bank of the College Burn, near Hethpool. One for every ship in the Royal Navy, it was said. The great oak wood was never needed, of course, as warship technology moved on to iron-clad vessels and beyond. And so the Collingwood Oaks were allowed to mature into the 200-year-old beauties we see today. Note: On the other side of the road which runs up the valley – directly opposite the Collingwood Oaks – was planted another wood in 2005. Called the ‘Trafalgar Wood’, it was created to mark the 200th anniversary of the famous battle. Oaks, of course.